When does Legal Expenses Insurance cover you for a Personal Injury Claim? You are here: Home / FAQs / When does Legal Expenses Insurance cover you for a Personal Injury Claim? Cammy Keith, the all-time leading goalscorer for Keith football club, went viral on social media following his side’s lead to defeat to Rothes on 03 February 2018. Keith (the player) scored both goals for Keith (the team) and so, on results pages, it appeared as though he had almost achieved a near-impossible outcome: a draw where one player was up against a full team of 11 players. A tweet that he had put in the “quite the shift” was retweeted many times. In that case, the bare statistics gave a misleading impression as to whether it had been a fair match. As an injured person with a possible personal injury claim for compensation, it is never a fair match at the outset. You need to take every possible measure to tip the scales back to your side, even if you don’t level them up completely. The scales are weighted in favour of the insurer on the other side of your claim. This is because they have huge resources at their disposal and vast experience in the conduct of personal injury claims. For you, as the injured person, it will probably be your first time in that position and your financial resources will be limited. 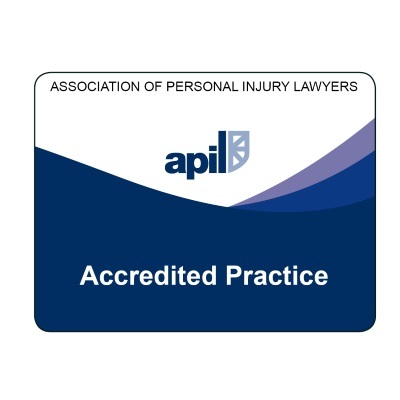 One of the ways you can improve the resources on your side is by instructing a specialist personal injury solicitor. And if you can find a way to fund the services of that solicitor without it coming directly out of your pocket, so much the better. There are a variety of options, including legal aid (in Scotland) and “no win-no fee”. In this article, we are looking at how you can boost the available resources and negotiating power on your side of the case through legal expenses insurance. Many people have legal expenses insurance without knowing it. It is often an add-on to a motor insurance policy or a house contents insurance policy. In this article, we will look at 3 questions to do with legal expenses insurance (LEI). Firstly, how do you find out you have legal expenses insurance cover? – What are you looking for in a policy? Secondly, who will be covered to make a claim under such a policy? Is it just the named policy holder? Finally, we’ll consider which solicitors will be covered to make a claim on your behalf under LEI. 1. How do you go about finding out if you have LEI to cover a personal injury claim? If you think you might have such cover, you need to start by looking at the policy document. Typically, it will have a number of summary headings including “Legal Expenses”. In some instances, it will state that that is “Not Covered” or “Not included in cover”. In that case, you will have to look at another option, such as Legal Aid or no win-no fee. If it is covered, the limit of insurance cover may be stated – e.g. £50,000. If the cover seems to apply, you will then need to refer to the policy terms and conditions to check out in detail what cover is provided. These are usually contained in a separate booklet. Alternatively, they will be available on the insurance company’s website. 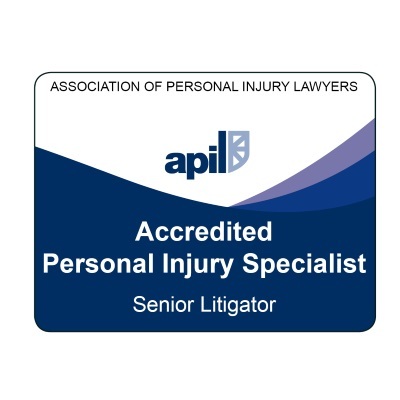 Typically, you’re looking for a section headed “Personal Injury”. A sample excerpt from a policy is set out below for you to see. 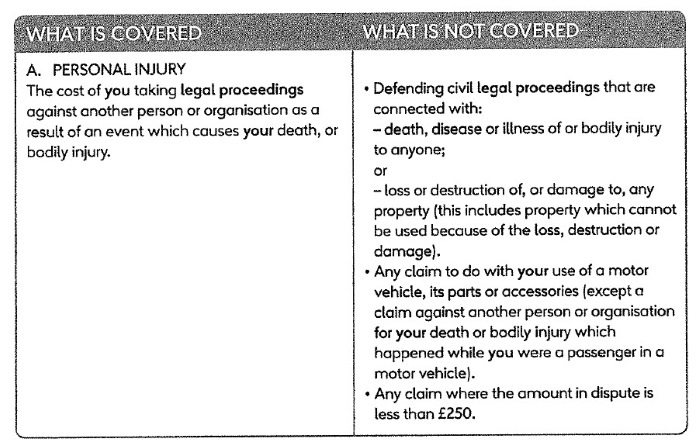 A typical clause in a Legal Expenses Insurance booklet covering Personal Injury claims. Does the policy cover this particular type of accident? If so, will the policy cover your own solicitor’s legal costs? Do the insurers need to give permission before your solicitor instructs any experts (e.g. a medical expert), counsel or incurs any significant financial outlay? Will your solicitor have freedom to choose the experts and counsel they prefer or will the insurers impose restrictions? Will outlays be funded by the insurers as the case progresses or will the insurers expect your solicitors to fund these? Is there any requirement as to the status or qualification of the solicitor or fee earner dealing with the case on a day-to-day basis? Is your solicitor able to issue proceedings on your behalf, if necessary, and, if so, is this subject to any specific reporting/review of the case? Will the insurers provide full indemnity in respect of any liability you may have for the costs of the opponent in the event of the claim not succeeding? If not, what is the limit on the indemnity (what’s the maximum amount the insurer will pay under the policy)? In the event of the opponent lodging a Minute of Tender or offering settlement at a level which, on the solicitor’s advice, you reject but subsequently fail to beat, will the insurers indemnify you in respect of any costs of the opponent incurred as a result of that advice? Are there any “unusual” conditions relating to the policy, limiting what your solicitor can do for you, of which you need to be aware? 2. Who is covered to make a claim under a LEI policy? Typically, legal expenses insurance will cover the policyholder and other members of the family who have that address as their home address. It is best to clarify at the outset what the extent cover is. Do not assume that other family members will automatically be covered under the policy as well, if it is a multiple claim. As for any claim situation (including legal aid and “no-win-no fee”), the fact that you have legal expenses insurance cover does not of itself mean that you will be entitled to proceed with a claim, come what may. The insurers will want to be satisfied that the claim has reasonable prospects of success. This usually means the need to show that it has a better than 50/50 chance of succeeding. The test has to be satisfied not only when the insurers are deciding whether or not to make cover available; you have to keep it under review as the claim proceeds and if new evidence comes to light which suggests that the prospects of success are less than 50/50, you probably will not be allowed to proceed further with the claim. Legal expenses insurers will want your solicitors to justify to them why there is a better than 50/50 chance of success. They will have their own in-house solicitors or separate panel solicitors to give them independent advice on whether the prospects of success are sufficient. 3. Which solicitors will be covered to do work under a LEI policy? Legal expenses insurers will put pressure on you to go with their choice of solicitor rather than your own choice. They are allowed to refuse to confirm to cover a solicitor of your choice where a claim is being negotiated and there is no court action yet. If it becomes reasonably necessary to raise a court action, however, they must allow you to use the solicitor of your choice (assuming your solicitor can show a reasonable level of expertise in this area of law). Accordingly, it can be tempting to take the “easy option” and go with the solicitors the legal expenses insurers wish to appoint on your behalf. On the other hand, there is only a possible financial risk to you from the point where court action is required. That’s because, if the claim fails, you will probably be responsible for the other side’s costs. Accordingly, you need some form of “insurance” to protect you against the risk that you lose. There’s no financial risk to you before a court action is needed to press your claim. In many cases a court action is never required because the claim is settled by agreement. Accordingly, there is no prejudice to you in using the services of a local, specialist solicitor, if you wish. 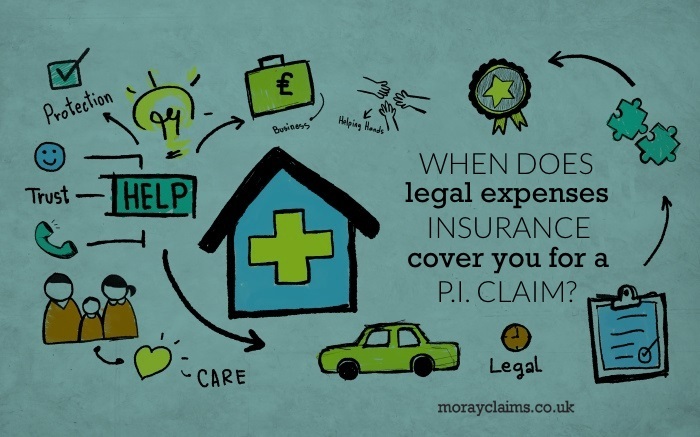 Any panel solicitors appointed by the legal expenses insurers are unlikely to be local you, certainly if you live in Moray. Being injured in an accident is one of those situations when it is worthwhile checking your insurance policies to see if some form of legal expenses insurance is lurking – trying to avoid being discovered! We recommend you show any possible policies to your local, specialist solicitor and let them determine whether relevant insurance cover looks likely to be in place. If so, they’ll want to clarify the exact extent of any cover with the insurers before any significant amount of work gets done. It’s important to be clear as to the scope of any cover beyond the policyholder named in the insurance policy. Other family members may well be covered, if they have been injured – but it’s best to make a specific check with the insurer. Because insurers are entitled to insist on using their own panel solicitors were a claim has not had to go to court yet, your local, specialist solicitor will not be covered by the insurance unless it is necessary to raise a court action. There is no financial risk to you while the claim is still at the negotiation stage. It is only at the point where court action requires to be raised that there is a financial risk to you – the risk that you might fail and be responsible for the other side’s court costs – so, if the insurance kicks in at that point, all is well. If you have any questions about this, please get in touch with us. All initial enquiries are free of charge and without obligation to take matters further. This is a long article and we would be keen to explain anything which is not clear to you. 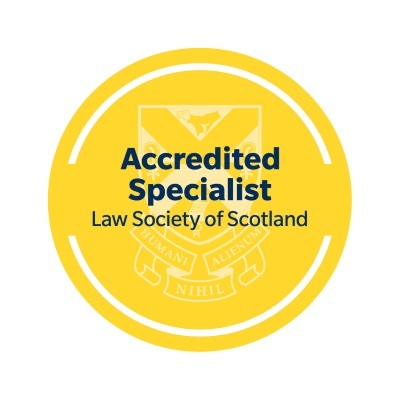 You can contact one of our accredited specialist solicitors – Marie or Peter – on 01343 544077 – or you can send us a Free Online Enquiry.